Summer Fresh is a Canadian, family-owned manufacturer of gourmet hummus, dips and salads, serving the retail and food-service market for 25 years. For Summer Fresh, "Food is Fashion"
Summer Fresh Salads was founded in 1991 by Susan Niczowski, with headquarters in Woodbridge, Ontario. The company has been recognized with a number of prestigious awards from the food industry and business community. Today, Summer Fresh is a $100 million company and products are made in a 63,000 square foot facility in Woodbridge, ON and distributed throughout North America, including include major grocery chains, delis and restaurants. 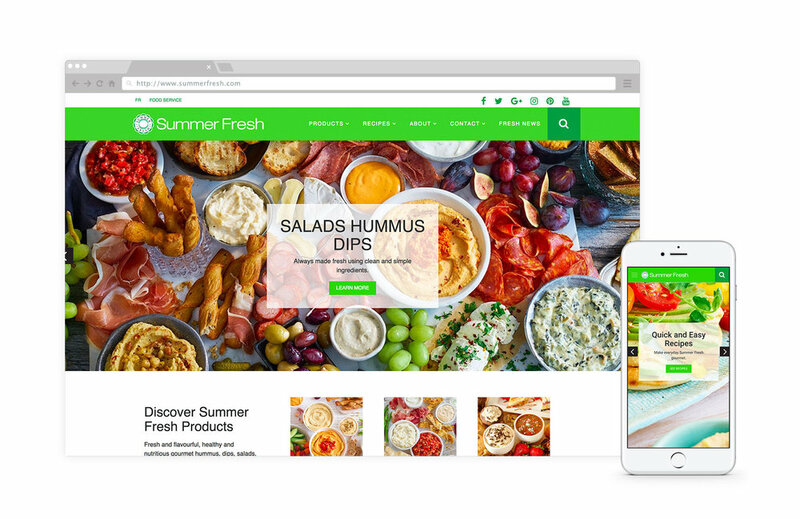 Summer Fresh partnered with DesignedUX to design and develop two new bilingual (English & French) websites, one for consumers and one for food service. Their existing Wordpress website was out-dated and provided limited utility. Summer Fresh wanted a fresh new look that was clean, modern and fashionable. The new website would entice visitors to discover a variety of healthful products (mmmm hummus!) and learn how to incorporate these into daily life with useful recipes. We designed the new site with a generous amount of white space to showcase the gorgeous food photography of their delicious recipes. We incorporated their trademark green as an accent colour to convey a fresh look and feel. On the backend, we built the website in Wordpress with a mobile first approach. We also created custom product and recipe taxonomies and functionality so that Summer Fresh could update the site internally. We designed a new blog as well as coupon options and integrated Instagram.